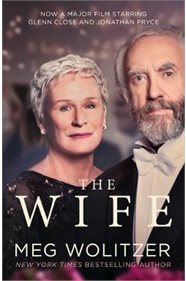 "NOW A MAJOR MOTION PICTURE STARRING GLENN CLOSE A husband. A wife. A secret. Behind any great man, there's always a greater woman. Joe and Joan Castleman are on an aeroplane, 35,000 feet above the ocean. Joe is thinking about the prestigious literary prize he is about to receive and Joan is plotting how to leave him. For too long Joan has played the role of supportive wife, turning a blind eye to his misdemeanours, subjugating her own talents and quietly being the keystone of his success. The Wife is an acerbic and astonishing take on a marriage from its public face to the private world behind closed doors. Wolitzer has masterfully created an expose of lives lived in partnership and the truth that behind the compromises, dedication and promise inherent in marriage there so often lies a secret... `A triumph of tone and observation, The Wife is a blithe, brilliant take on sexual politics' Lorrie Moore"